She also wore pearl and diamond earrings, a lavish pearl choker necklace, pearl and gold bracelets, the Order of the Seraphim, and her husband's family order. The yellow dress is an example of extreme, Princess-Anne-style royal recycling: she's been wearing it at gala events since the late 1990s. Crown Princess Mette-Marit of Norway wore her wedding tiara, plus diamond floral earrings with a red pendant drop. She also wore diamond daisies nestled in her hair. She's also wearing a diamond bracelet and the Order of the Polar Star, the second-highest Swedish order. Princess Martha Louise of Norway wore her eighteenth-birthday gift tiara, plus a modern diamond necklace and a stunning pair of earrings that look to be set with amethyst and peridot. She also wore a geometric ring, a small diamond brooch, and the Order of the Polar Star. Queen Margrethe II of Denmark dripped with diamonds, wearing the Baden Palmette Tiara (one of her go-to tiaras for weddings, with its very appropriate heart shapes), plus diamond earrings, a diamond necklace, an elaborate diamond brooch, and a huge diamond ring. She also wore the Order of the Seraphim, her father's family order, and the ribbon and badge of the Order of the Dannebrog. Crown Princess Mary of Denmark wore the pearl and diamond version of her wedding tiara with pearl and diamond earrings. Mary secured her hair with a diamond brooch. Mary also donned a pearl bracelet, the Order of the Polar Star, and her mother-in-law's family order. Princess Marie of Denmark wore her go-to sparkler, Princess Dagmar's Floral Tiara. Because she doesn't have a Swedish order, she wore her highest Danish order: the Order of the Elephant. Queen Mathilde of the Belgians was stunning in the base of the Nine Provinces Tiara. In very exciting jewel news, Mathilde's pearl and diamond earrings appear to be the same earrings worn by Queen Fabiola -- yet another example of the late queen's jewels popping up in Mathilde's collection. She's also wearing Queen Fabiola's diamond waterfall brooch. She also wore the Order of the Polar Star and a pair of diamond bracelets. My pick for the best-dressed of the entire event was Queen Maxima of the Netherlands, who wore the tiara, earrings, bracelet, and necklace from the gorgeous Mellerio Ruby Parure. Maxima also wore the Order of the Polar Star and, like the intelligent woman she is, carried a fan, as ceremonies in the chapel always seem to be warm. The Mellerio Ruby Parure actually does include a jewel-encrusted fan, but this appears to be a different one. 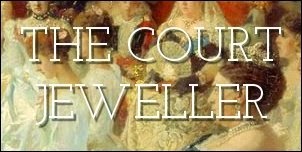 The Countess of Wessex glittered in a tiara we haven't seen in a while: the diamond and aquamarine tiara by G. Collins and Sons that converts to a necklace. The intrepid Anna, who writes a great blog about Sophie, has identified the necklace as probably also being a Collins piece. Sophie's also wearing a pair of diamond earrings that have been in her collection for a while. Because she doesn't have a Swedish order, Sophie wore her British order, the Royal Victorian Order. She's also wearing her mother-in-law's family order. The Princess Takamado, a member of the Japanese imperial family, wore a lovely set of pearl and diamond jewels. Hisako is wearing her highest Japanese order, the Order of the Precious Crown, and she's secured the sash with an intriguing diamond brooch in the shape of a bird. The non-reigning royals brought a bit of sparkle with them, too. Princess Tatiana of Greece and Denmark, daughter-in-law of the last king of Greece, wore a brand-new diamond tiara to the wedding. Tatiana also wore gorgeous diamond earrings and her highest Greek order, the Order of Saints Olga and Sophia. Princess Ursula of Bavaria wore a small diamond tiara with pearl and diamond jewelry. Princess Anna of Bavaria wore the same small diamond fringe tiara that she wore at Princess Madeleine's wedding -- it's reportedly from the collection of her own family, the Sayn-Wittgenstein-Berleburgs. That's it for the royal wedding guests! Which jewels were your favorites?